From bare foot times when we relied on agility and endurance for survival, to the present day when our command of language is what makes or breaks us, there have been few times in history during which our feet – or someone else’s – did not carry us. Even though our feet are normally reliable and loyal we have a knack for ignoring and even abusing them. The brutal practice of foot binding, for example, created a deformity that certain cultures viewed as a mark of beauty. 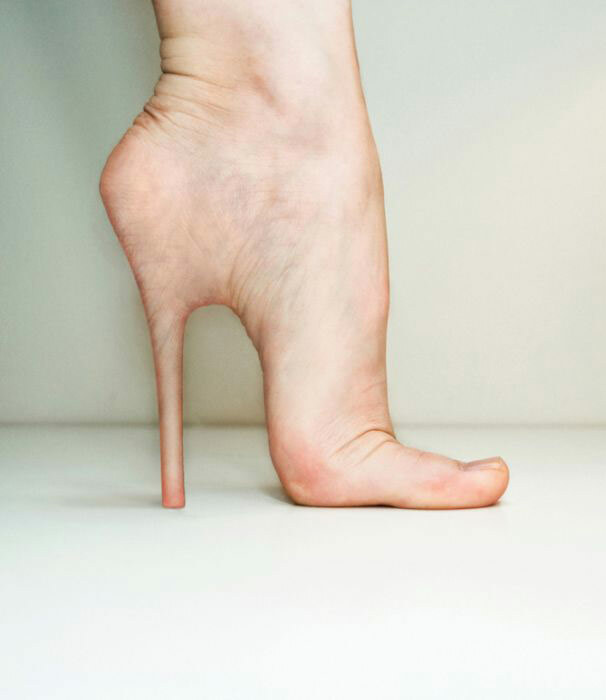 While foot binding died off with a refusal to tolerate the lifelong disabilities it caused, today’s high heels with their narrow toe boxes and sharp points might be considered just as punishing. Consider this: for every two inches of heel height the ankle must rotate by ~23.5 degrees, while it undergoes a 45-degree change in four-inch heels. Feet are the foundation from which we move; problems in the feet can lead to compensatory patterns in the rest of the body. Structural changes can occur in the knee, hip or spine, and head placement and gait may be altered. This commonly results in ankle, knee, hip, low back and even neck pain. In heeled shoes, structures in the calf like the soleus and achilles shorten, the calcaneus bone lifts and the talonavicular (TN) joint drops. Over time, the mid-foot may even collapse. Ouch! We began wearing shoes as necessary protection, but over time most shoes have decreased our proprioceptive awareness and changed the way we move – and not for the better. Technology provides arch support, motion control, attractive design and cushioning. Running shoes are purchased as slightly larger shoes assuming that the foot will eventually deform and fit them. Flip-flops allow us more freedom, but the foot tightens up in dorsiflexion and then slaps the ground as we move along and for some this lead to imbalance. Oriental medicine (OM) includes acupuncture and bodywork – including acupressure and reflexology – in its view of the foot as one of many microsystems representative of the rest of the body. It prevents and treats diseases by stimulating points (zones) on the foot to regulate zang-fu (yin-yang) organ function and soothe qi and blood in the channels. There are 33 points found on the six basic meridians of each foot. Perhaps not-so-coincidentally there are 33 joints in each foot. All acupuncture/acupressure points on the feet can be used to treat local conditions, while many of them are the most powerful points for treating conditions affecting organ systems or pain in opposite limbs. The most distal (farthest away) points on a channel affect emotions, regulate temperature, strengthen the body and can relieve heaviness in the limbs and joint pain. The feet in particular can help with head and face conditions. 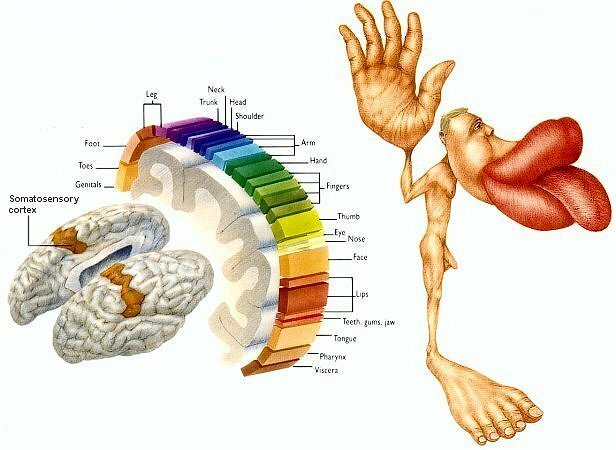 In the cortical homunculus, a sensory map, our brain views the feet, hands and mouth as being proportionally larger sense organs than the rest of the body. But allopathic medicine tends to use orthotics such as boots, arch supports, cortisone injections and surgery – all which serve to numb or restrict movement – as answers to every problem. With so much potential, it is a wonder that we have come so far in desensitizing our feet. There has been a recent movement to return to our barefoot nature with the introduction of the Vibram 5-Fingers and similar minimal concept shoes. More research and education about the benefits of going barefoot are giving us a greater understanding of how having healthy, functional feet affects the rest of our bodies. When I attended the 2012 SCW Dallas Mania in August, I found Vibram Five Fingers fitness advisor Stacey Lei Krauss to be the highlight. She brought together years of experience and training working with and improving foot function. Her knowledge base and presentation skills made for informative and enjoyable seminars. Krauss says that bare feet tend to have improved blood circulation and nerve reflex action, and that going barefoot or minimal will “wake up your feet.” Because “minimal” does not imply extra cushioning or support, Krauss suggests going barefoot on concrete first since we are less apt to stomp or run quickly over a hard surface. There is more reaction or proprioceptive awareness required of the feet on soft uneven surfaces such as sand and grass so these surfaces should be approached over time. Important points to remember for maximizing minimal shoes like Five Fingers as you re-learn how to run include foot strike, compliance (allowing the feet to relax), tempo, and posture. Kraus offered a few starter protocols for care and strengthening of newly bare feet. Self-Massage Sequence Before or after workouts and on non-workout days. ~3 minutes. Rub each toe, lengthen, split (forward, back and wide), toe fan. Slide fingers between toes and move forward, back, sides and figure eights. Thumbs on transverse arch (landing pad). Try to feel each metatarsal head. Rub an elbow or knuckle along the arch (and plantar fascia). With your thumb and first two fingers rub the achilles tendon up, down, across and around. Use both hands to friction-rub the ankle in a twisting motion. I would recommend soaking feet in warm soapy water, or a warm herbal soak, for 10 minutes before following the sequence. Make sure water is deep enough to reach your ankle bones. Do this protocol for a minimum of two weeks to one month. Can be done pre- and post-run or workouts. Do each exercise a few times. While standing barefoot raise the toes up, spread the toes. With the toes up try thumb taps, pinky taps, back and forth. Eversion (roll the foot out), inversion (roll in). Grip the ground with toes, hold and release. 1 heel up ankle circles. 1 foot up dorsiflex (toes down), plantarflex (toes up). Grip floor with the other foot. Split stance calf stretches – gastrocnemius (straight leg) and soleus (knee slightly bent). Krauss says to start jogging at about 10 minutes max. Bring your regular running shoes with you and change before the long part of your run. Your feet (and ankles, and calves) will thank you. After reaching 10% of maximum weekly distance progress at no more than a 10% increase at each week. Expect tight calves and achilles complex at first. Always allow time for a foot-specific warm up and cool down. Starting tempo runs at about 180 beats per minute is recommended for beginners. This sounds fast but it actually decreases the load and distance between each step. Having done post-race massage for runners, I have met runners who used their minimal shoes for the first time during a race. A three-mile run in new minimalist shoes can create major tightness and discomfort post-run for the uninitiated. Remember you are waking up muscles and joints that have been lulled to sleep by restrictive and cushiony footwear for a long time. It’s going to take a while to re-educate these structures, but your patience will certainly pay off in less ankle, knee, hip and back pain overall. Consider the information I have provided and continue to learn by utilizing good resources such as Vibrams’ website. Great share! I’ve been actively working on improving my feet for a couple of months but I can’t even get my feet into a pair of Vibrams. I’ve got some crazy bad bunions but the exercises and stretching have really helped. My single leg balancing is a huge challenge though. Putting weight & pressure on the big toe joints is a killer. Thanks Cheryl. Keep up the good work. If you need help with the pain relief side of things feel free to contact me.